This week my wife, Patricia, was in hospital for a day procedure. Check-in in the morning, check out in the evening. In between, the joys of a general anesthetic and a little pain relief. The hospital ward where I waited for her, and with her, was a place of particular sensations and impressions, as all hospital wards in the past have been. One tends, however, to cast them aside at the last hand wash station and the automated rotating exit door and, by the time you’ve hit the car park, the likelihood is that you have left them behind altogether. It’s hard to be the guy waiting around a six bed ladies ward for your wife to return from surgery. Not as hard as being in the theatre, one might argue, but still hard. You don’t want to be in the way, to invade anybody’s privacy, but everywhere is in the way and nobody has sufficient privacy. The crossword puzzle is an enigma worthy of Bletchley Park and your book is a binder filled with worthless scratchings. Tea comes around but it’s not for you. A radio is too distant to hear. A television too angled to view. A woman comes up the corridor, ringing a small bell with patient regularity. This has an ancient ritualistic feel which is entirely incongruous among the machine beeps and the digital displays. The bell is an unknown quantity. Is it a warning of some passing contagious disease? Is it a call to a meal? The latter is the closest to the truth for it is a nun in civilian disguise, alerting the patients to the arrival of holy communion from the morning mass. I think about how I would hate this bell if I was here confined to a bed. The ‘oldness’ of it. But then I think of the people to whom it most be a comfort of sorts and I make my peace with it and smile at the nun as she glides serenely past me. Patricia is wheeled back in. She is awake and not awake, all at the same time. Over the weekend, she was at a nice hotel with her sisters, celebrating a birthday. Everybody was submitting themselves to some sort of spa treatment but Trish, not being in the mood for pummeling, settled for an unheard-of manicure and a nail gloss of brightest perkiest pink. The nail varnish had to be removed again, two days later, to satisfy the requirements of the surgical theatre. Now, as she sleeps/wakes, I notice the pink remnants of the pretty varnish, clinging to the edges of her fingernails. Time passes. A blood pressure machine farts its pressure cuff into life periodically, beeps a reading, then hisses itself flaccid once more. 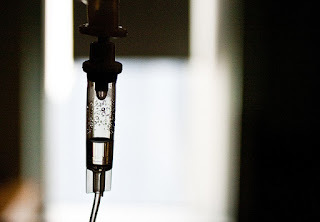 A saline drip dispenses its wares, oh so painfully slowly, into a cannula on the back of her wrist. I think how lucky I am. Fifty Two years old and I have never needed a cannula. I think this situation cannot easily pertain for very much longer. My genes and my wicked sugary ways will catch up with me soon enough. As she dozes, I note the other people in the ward. Two are day-cases like she is. Both came back earlier from surgery and both are now alert and clearly casting around mentally for the quickest way to get out. One of the ladies gets regular mobile phone calls and her ringtone is that one that sounds like an old phone from the fifties. It seems in keeping with the ward curtains and the communion bell. One ancient lady tries to nab every nurse who passes and they dodge her as best they can while answering her queries with kindness and empathy. Someone tells me that she clearly repeats her queries, all day, every day, with unerring regularity. Another lady sleeps through her evident pain and snores. Her snores sound like words and I try to decipher what they are but they remain, like her dreams, outside of my reach. The young girl in the opposite bed is overwhelmed with family visitors and a gentle tattooed boyfriend. Two nurses visit now-sleeping Patricia and make copious notes in charts and folders. They whisper to each other that her 'sats' are visibly dropping and a red LED display confirms this with a 93, 92, 91, 90 countdown. An oxygen mask is quickly applied, without any sign of alarm, and the sats promptly climb back up again 91, 92, 93, 94… The rest of my time there is coloured by the numbers on that machine which, thankfully, stays high even after the mask is removed. At last she is fully awake and tea from a tiny teapot and toast is consumed, breaking a day long fast. Another hour or two and we are free to go. We leave the old ladies and the young girl to their evening together. The others have already gone. Four days later, it is the finger nails that remain the most vivid impression. It's almost as if they were a metaphor for the things we must give up when we need to be in a hospital, for the things we simply cannot hold on to. Over the last month, my local favourite place, the Linenhall Arts Centre here in Castlebar, have hosted a couple of very interesting evenings. Over two nights, separated by a few weeks, they got some talented artists in, to sit before an audience in the theatre, to discuss their work, their origins and their process. On the first evening, hosted by Marie Farrell, we had contemporary dancer Liadain Herriott and visual artist Alice Maher. The second evening, which happened just this week, gave us writers Colin Barrett and Ger Reidy. The three artists who could present a little of their wares, did. For Alice, as a visual artist, it would have been impractical but she more than made up for that with her forthright and insightful contribution to the whole. On the first evening, Liadain gave a remarkable dance performance. Certainly for me, who sees so little dance, it had an immediacy and danger that one might only find in the most heightened of theatrical experiences. On the second evening, the two writers read us some of their stories and chatted to Eamon Smith who drew them out carefully as far as they would go. Two things, in particular, came out of the evenings for me. Firstly, it confirmed the nagging sense of frustration I get whenever visual, dance, and other non verbal artists are asked to account for their work in words. Words are the tools we all use to understand things at some tangible level but sometimes the best understanding is on a more obtuse plane. Non verbal work can prod and nudge us at the most base emotional levels if we allow it to and if it connects with us. Words can get in the way. They are the lowest common denominator upon which we try to find something to share about the art and, in doing so, we can only dilute or even diffuse the neural connections that are being tentatively formed. I sometimes think we should give our response to dance with a little dance of our own and to visual art with a pencil and some paper. Despite this, Liadain and Alice fielded the requirement to verbalise their art with grace and knowledge and the result was always interesting and often great fun. For the second evening, one could have expected a more appropriate verbal analysis of the art because the artists were wordsmiths themselves. At least, here, there was this common literary medium between the work and the audience. It was the discussion after the readings that gave me my second lesson. The writers were both amenable and engaged with the evening. They took the questions that were given them and considered them and engaged with them in an open, thoughtful and entertaining way. Oh, but how they squirmed. Not outwardly. As I said, they were great outwardly. But one could see the vulnerability, the unease, the uncertainly which the questions stirred deep inside them. Why did they write what they write? Where did the stories emanate from? What made them start writing? What keeps them writing? How do they write? What is the secret? What is the secret? What is the secret? It occurred to me that Ger and Colin, highly talented writers both, looked momentarily like men being probed about what they thought of Dublin when they felt they had only just cleared Charlestown. They answered as best they could and there was insight and experience in their answers but, for me, the best answer, the most valuable one of all, was in the one they simply could not give. What these evenings taught me, or at least reaffirmed for me, is that there is no answer. There is no magic secret to creativity. As far as I am concerned, there is only one link between all the artists and creative people we know who continue to make Art. They keep on keeping on. They follow their own inspiration and walk their own path and keep the faith as best they can. The rest is mere detail and it varies from person to person. It can be anything, it can be nothing. The artist keeps going while the rest of us stops or never even starts at all. As Eamon Smith remarked, near the end of the second evening, a sizable proportion of the audience had been made up of people who were themselves creative or artistic by nature. This, I think, is understandable. It’s a lonely business, this keeping on, and it’s natural to take any opportunity to see how the other people over the wall are managing to do it. I hope they got as much out of the evenings as I did. The lasting image I got is a rather strange one. 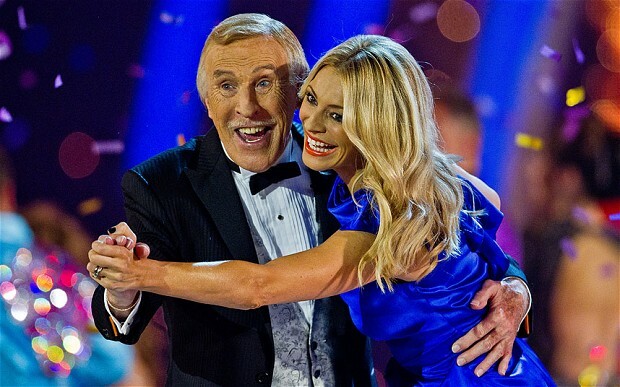 It’s Bruce Forsythe and Tess Daly at the end of an old Strictly Come Dancing show. As the titles start to roll they engage each other in their trademark good humoured lightweight embrace. But, instead of saying ‘keeeep dancing’ as they normally do, they dip forwards towards us and say, 'keeeep working’. I have a bad habit of letting stories slip past me. Whoops, there goes another one. Well, it wasn't a story, really. Not exactly. It was more of a notion. A possibility. A fleeting thought. It's gone now anyway. I missed it. Many of the writing gurus advocate the keeping of a little notebook to set down the passing ideas and phrases and events that colour one’s everyday life and, yes, I have one of those and, yes, I do that. But this not so much about the jotting down of a ‘thing. It’s more about the appreciation of that thing as something of possible value and something which might, with a little effort, develop into a greater and a more lasting thing. Potential stories which I often let slip past me. 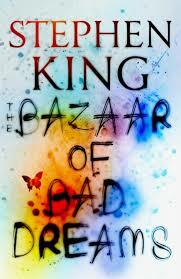 This week, I’ve been reading Stephen King’s latest short story collection ‘Bazaar of Bad Dreams’ and it was while reading it that this thought occurred to me. I don’t think Stephen King is the kind of a man who lets too many stories slip past him. I think he’s brave enough to explore whatever germ might land in his brain, to let it grow a little, perhaps fertilise it a bit, to see in what direction it might expand. I think this trait is evident in those stories which make it into his collections. There are gems there and masterpieces and a share of duds (all subjective, of course) but, most of all, these is variety, diversity, colour and life. One feels that, if one tried a little, one could almost trace them back to the microbe that birthed them. For my own part, I may spot a seed of a story, something that might become something worthwhile, but I don’t give it the necessary energy to see if it germinates. I also think that it’s something that needs to be done quite soon after the discovery of the idea. If not, the elusive something that initially made it seem like a good idea gets lost and, upon later revisiting, the note you made may just seem silly and even indecipherable. One of the problems is that the idea, at first, can seem as if it’s nothing more than that. An idea. Is it a good one? Is it a duff one? The only way to know is to poke it around a bit and see if it starts to crawl. One thing is for sure. The act of poking it will help it develop. It won’t develop much if it’s just left sitting there on its own. Granted, occasionally, an idea will jump up, all by itself, and turn into something magic right before your very eyes but that’s the exception rather than the rule. Maybe I will kill it stone dead. Maybe it will simply grunt and shuffle away. But maybe, just maybe, once in a blue moon, it will jump up and dance around for me.